Two screenings of Not In Our Town films in Massachussetts sparked discussion about how to resist hate and intolerance in campus and community settings. Patrice O’Neill presented Light in the Darkness at the Mahaiwe Theater in Great Barrington, MA and Waking in Oak Creek at UMASS Boston with the Conflict Resolution School. Over 120 community members from Berkshire County gathered to view Not In Our Town Light in the Darkness at an event to spark dialogue about how to stand up to hate and intolerance. 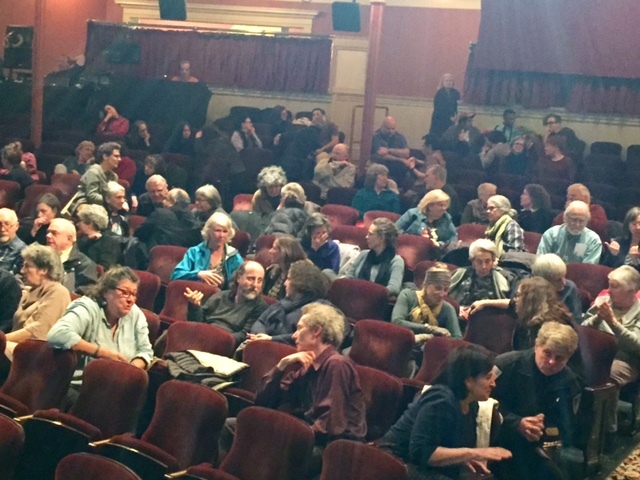 Not In Our Town Executive Producer, Patrice O'Neill joined community leaders in presenting the film at the Mahaiwe Performing Arts Center in Great Barrington on April 4. The screening, co sponsored by local organizations and the U.S. Attorney's Office was part of a kick for a Not In Our County program in cities across the region. Challenges for immigrants and other community members who are feeling the impact of intolerance were surfaced in the discussion. Jennifer Tabakin, Great Barrington Town Manager, spoke about the community's commitment to standing up to hate and a new Trust Policy the city is considering. Chief Michael Wynn of Pittsfield affirmed his commitment to addressing hate crimes, saying that hate was not just a law enforcement issue, but a public health problem. In advance of the events, Multicultural BRIDGE Towards Racial Justice, a non-profit dedicated to promoting mutual understanding among diverse groups, hosted screenings & discussion of the original Not In Our Town film across three cities in Massachusetts, including North Adams, Housatonic, and Pittsfield. Director Gwendolyn VanSant and other leaders and volunteers in Multicultural Bridge helped organize the screenings to gauge interest and engagement for NIOT. "Having the privilege of hosting Not in Our Town screenings before her arrival and then having Patrice O'Neill lead us through a powerful evening of reflection and inspiration of what we can do as a community to claim our values, support our youth and cultivate safety, equity and inclusion County-wide was a remarkable gift and investment in our future and the future of generations to come. The day after the Light in the Darkness Screening, twenty community activists and leaders gathered to begin mapping out plans for county wide NIOT activities. The next meeting of the NIOT group will happen on April 25, followed by a screening of NIOT Billings at the Imagine Cinema on April 26 in Williamstown. Plans to spread the NIOT pledge are underway. A diverse group of students and faculty members participated in an open discussion after a screening of Waking In Oak Creek. After a moving set of comments about the message from Oak Creek, and the connections that were built between the Sikh community and their neighbors, the discussion focused on who is vulnerable to hate on campus and in the community and how to find solutions. The controversies over immigration and how to stand with immigrants who feel threatened were front and center in a challenging part of the conversation. A group of students who lead organizations that support students of color signed up to organize screenings of the film for their classmates. Eben Weitzman, Professor in the Conflict Resolution Department saw the film at a screening in Lexington, MA in 2016 and wanted to bring the story to his students and colleagues to begin a discussion about how the NIOT model works to help communities grapple with hate crimes. Patrice O’Neill began discussions with faculty members in the department, and the Director of Diversity and Inclusion about how to introduce Not In Our Town programs at UMASS. The campus is a public institution serving nearly 17,000 students in the Boston area. Both events were convened with support by the U.S. Attorney’s Office in Massachussetts. Thanks to Eben Weitzman and the Conflict Resolution Dept. at UMASS. Multicultural BRIDGE's Gwendolyn Van Sant was a key convener of the screening and the Not In Our County campaign. Many thanks to Cara Henderson and Kevin O’Regan, and the powerful leaders in Berkshire County who have committed themselves to standing up to hate and for inclusion in their towns. I'm so grateful to live in The Berkshires and to be able to support the wonderful work of MultiCultural Bridge!